As I mentioned before I had wanted an iPhone for a while but it wasn’t accessible enough for me until recently. Once they allowed a bluetooth keyboard to connect to help me with texting and setting up Proloquo2go on it my next biggest issue was keeping grip of it and keeping hands steady enough to use it. I looked at a few cases the older iMainGo2 which is battery operated and the iHome case, also battery operated. My main difficulty with these would be getting the batteries in and out, and if I was going to be using this as a communication aid on a regular/daily basis this would then become a frustrating daily event. So I decided to plump for the latest iMainGo case with rechargeable battery. I’d like to also quickly say here a Thank You to ‘Therapy Box’ who sent me a free US to UK adapter plug and a lanyard. 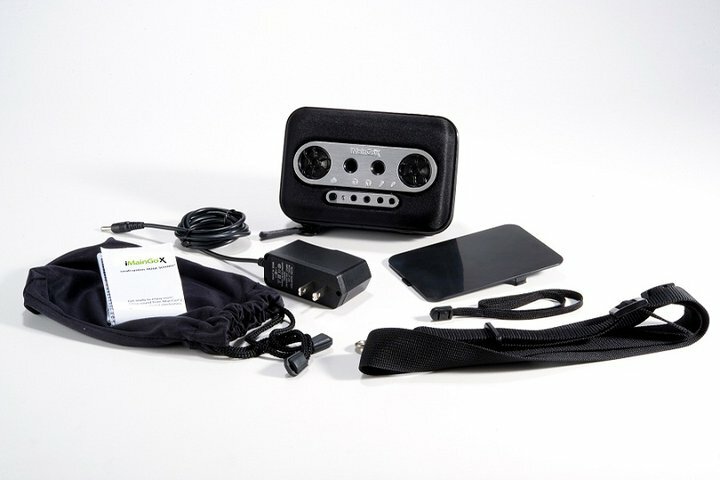 Therapy Box sells communication bundles offering a choice of iPod Touch, iPhone and iPad with Proloquo2go and also sell speakers and iMainGo’s speakercase. The iMainGo X case is chunky, it is about 2″ thick so sits nicely between my thumb and forefinger of both hands cupped in front of me. 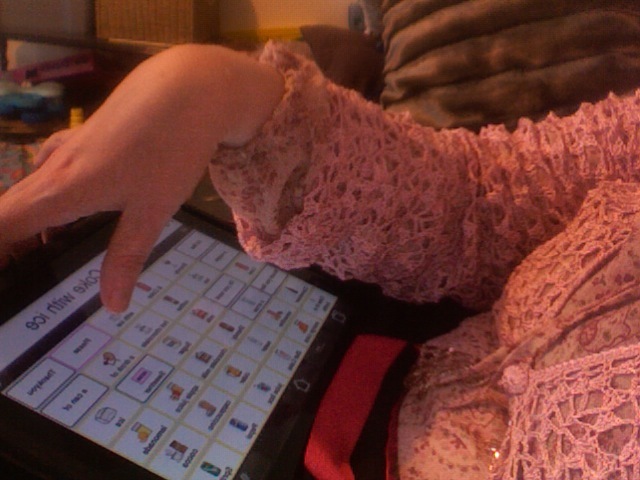 I find with my arms closer in to my body this reduces shakiness and my thumbs are free then to work half the screen each. It also adds a little weight to your hands and after a week of daily practice, I was able to reduce the button size when using Proloquo2go so I can now manage 4 x 4 on screen. 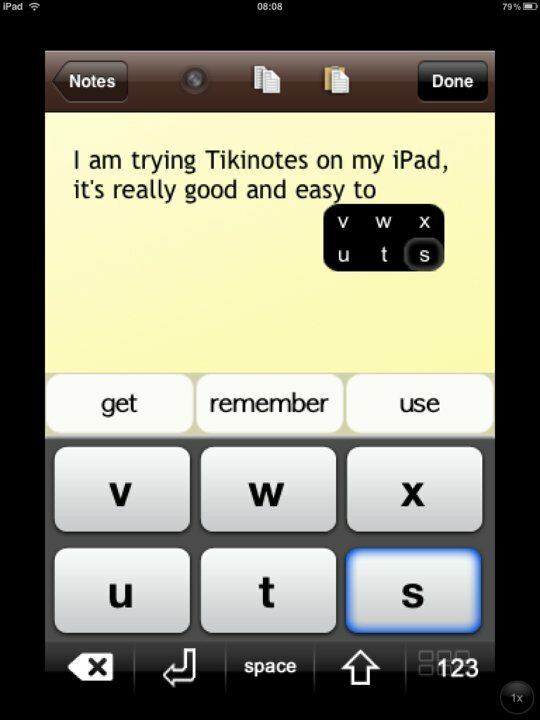 I also find the Tikinotes app easier to use for texting without having to get Bluetooth keyboard out to send a SMS. Its only got out now if someone texts me whilst iPhone is on charge (out of case) or when I am doing a lot of setting up new pages on Proloquo2go as only the standard iPhone keyboard is available in ‘edit mode’. Even with iPhone in case and thumbs steadier a full qwerty keyboard fitted into that tiny screen space is a little too small. I have managed using pogo stylus in mouth but as its not very long you have to hold the screen quite close up to your face, I am considering getting a mouthstick as it would also be handy for when my hands are really painful for typing on computer also and I still think I’d be quicker with one of those than headmouse or scanning/switches system. Its also much cheaper around £45 for a mouthstick compared with £250 for scanning program and £700-£900 for an headmouse! I could also use it to maintain my hobby of water colour painting. As drawing gets more difficult I’m also considering teaching myself to do finer detail work with a mouthstick and just use arms for larger background washes. 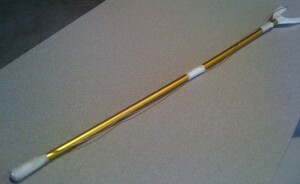 A mouthstick, with aluminium foil on the tip and copper wire wound up the shaft. A guy called David Wallace came up with this adaption for his iPod Touch. He discovered that copper wiring conducts those electrical impulses that come from human skin. He took a mouthstick and attached a Pogo Stylus to the tip, wrapped some copper wire around it so it’s touching the stylus, then had the other end of the copper wiring go along the mouthstick shaft all the way up to the mouthpiece. Then when he’s holding the mouthstick his lips are touching the copper wiring which sends electrical impulses from his skin all the way down to the stylus which allows the iPod Touch to detect the stylus touching it. With a scanning app also becoming available for the iPhone soon for emailing and SMS it is looking more and more accessible into the foreseeable future for those of us with fine motor challenges! Ataxia is a complex condition, that many people don’t understand, not even ‘medical professionals’. Learning from a book or a few cases is hardly the same as living with it 24 hours a day for the rest of your life (or your whole life if it is a genetic type). If you looked it up in a dictionary it would probably say it causes difficulty with balance and co-ordinating muscles and is a symptom of other conditions – such as MS, CP for example. Ataxia is also a neurological condition in its own right and there are over 40 different types. Each causes a slightly different set of symptoms and rate of progression. Even within a particualr ‘type’ of Ataxia there is variation in people on how it presents itself. Ataxia’s of Idiopathic cause (in other words they haven’t a clue why you’ve got it) has an even bigger variation as it depends on what has caused it, and if that’s not known the symptoms and rate of progression can be difficult to treat or predict. One of my biggest difficulties is the constant fluctuating muscle tone, somedays I have enough stiffness in back and legs to stand up as soon as I get out of bed. I can walk with something to hold onto as long as I can manage to keep my balance long enough to get from the bed to the toilet or the bedroom to the kitchen. Other days I find it quicker to just slide down onto floor and shuffle on bum to get into bathroom (have en suite doors in bedroom straight into adapted shower room/toilet) saves me having to hang onto rollator while I find my balance and get to the loo by which time I could be back in bed! this is particuarly handy in middle of night when not quite awake enough to concentrate that hard on staying upright! I’ve had a few painful falls landing between chair and bed and hitting ribs on push rims when trying to transfer half asleep and desperate for a wee! my theory is.. if I’m already on the floor I haven’t got as far to fall!!! Getting showered and dressed is a challenge with limbs that don’t go quite where you intended them to. Trying to desperately get your arms and legs into your clothes quickly cos your freezing is not much fun on a winters morning with minus temperatures, when its so cold it hurts! If my lower legs/ankles are still floppy by time I have got dressed I put leg splints on and special boots called Piedro boots these help keep my feet and legs in the right position and I can stand to get onto mobility scooter, or use crutches or a rollator for a short while. These each have their own difficulties. The rollator is great for around the house, means I don’t have to be sat in the chair all the time as it has a seat on it and can sit and push myself from room to room with feet I can do this without splints on, but with them on I can also take steps. Problems I have with rollator cos of its design and the seat is I’m constantly hitting the back wheels with my toes as I tend to have a wide gait to help me keep my balance. It’s also nearly as wide as my wheelchair is, so tight spaces are still a problem and its still difficult to fold. However I have an instant seat whenever I need to sit. 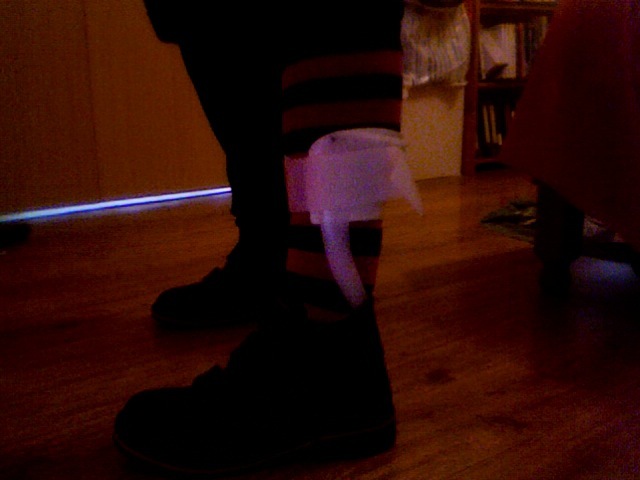 Crutches are good for some situations cos if I’m struggling with taking steps like over a low threshold I can swing on them, they are also good in tight spaces, if just going to brothers house, they fold to go in front seat with me and can swing a few steps from car into house. However they are difficult to use around the house as my arms aren’t free to do things whilst using them and I don’t instantly have somewhere to sit when needed. Vinyl, wood and laminate flooring is more difficult to walk on with crutches, carpet and deep snow is easier as the depth of the snow supports the bottom of the crutch and your foot and its a soft landing if you fall over! However you don’t instantly have anywhere to sit so distances have to be planned carefully to where you can stop to prop yourself up against something for a minute or sit down. It’s also exhausting cos of the sheer amount of concentration involved in trying to stay upright and get one leg in front of the other consistently, or even swinging on them takes considerable upper body strength. The shortest walks are exhausting and take a huge physical effort. A mobility scooter or electric wheelchair helps with reducing fatigue. 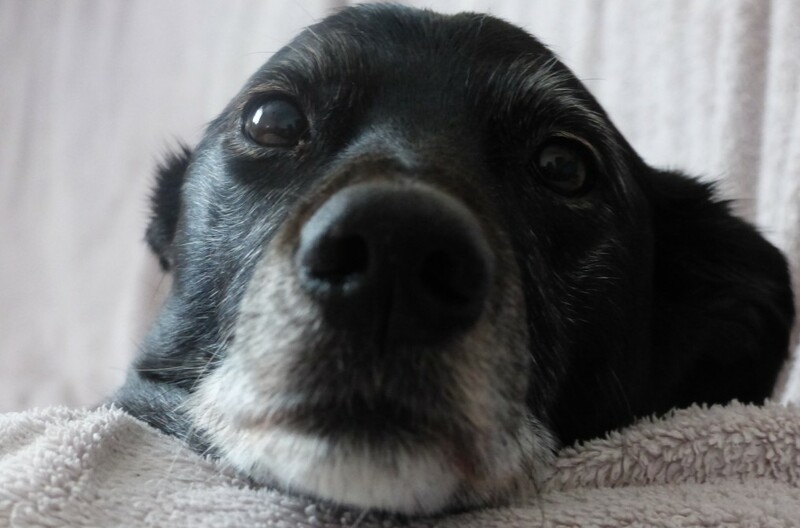 My neuro told me many years back that it was ok to use a scooter or electric chair for distance to preserve and manage energy levels as in the early days I was still trying to manage two walks a day with Inca. It was exhausting, walking over grass takes more effort to keep your balance or any uneven surface, I needed a way to manage her walks without leaving myself exhausted and unable to do anything else for the rest of the day. Ataxia doesn’t just affect my legs it also affects my arms and speech which as a signer as had big impact on communication, it affects my ability to sign fluently to deaf friends, it makes my arm movements jerky which makes things like trying to use crutches more dangerous, if arm twitches at wrong time as the crutch is moving you end up on the floor. Once a fluent touch-typist at over 200 words a minute I now struggle to hit the right letter on the keyboard unless its got a keyguard on, or my forearms are supported by bed covers. I can manage laptop semi reclined in bed, as front of laptop supports wrists and duvet supports forearms, making them less shaky than when they are in mid-air. I think the secret to surviving with Ataxia and developing compensation skills has been in researching and understanding how my body was working (or not working). 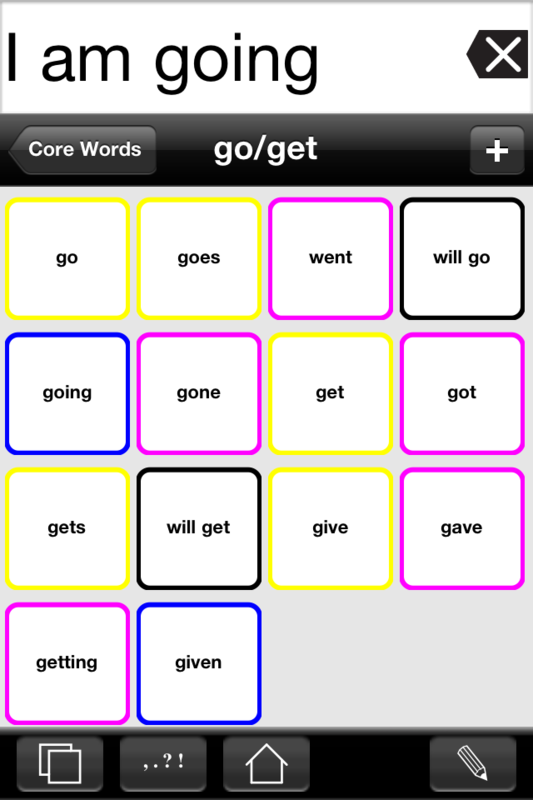 For example I recently discovered I don’t need as big buttons on my iPhone version of Proloquo2go as I do on the iPad. How can that make sense? Simply.. when it is in the case which makes it chunky and fills my hands to grip it, I have more control of my thumbs which each ‘work’ their side of the screen. Due to size of the iPad screen my thumbs alone can’t reach every icon/button without me raising my arm, making it instantly more shaky as its unsupported, so the targets need to be a bit bigger. Living With Ataxia for the last 8 years has been a challenge I wasn’t expecting to have to suddenly learn to cope with in my early 30’s but by far my biggest ‘disability’ is other peoples perceptions of me. What I should and shouldn’t be doing/be able to do. I’ve had people saying ‘awwh she shouldn’t be on her own’.. I CHOOSE to live independently.. I’ve had people talking to me like I’m 4 years old, talking over me.. this has mainly happened when I have been in the electric chair particuarly if I have also been using the Lightwriter which was my first communication aid. The iPhone did not originally have the apps/access I needed to be able to use it when it first came out (see iPhone blog), so I was given a Lightwriter by the NHS. Its a shame it wasn’t out then and the iMain go case, it would have saved the NHS £3,200!! The case both helps with gripping the phone and making speech output better for using it as a communication aid (full review coming later). I found I got a different reaction using the iPhone, I was in sporty style chair at the time as friend had taken me xmas shopping. I got ‘ oh wow.. is it that an iPhone?.. . it talks thats cool’ and got talked to like an adult asking for an item same as anyone else, (once they’d recovered from the surprise of a ‘talking iPhone’!). I know a few other deaf people who use this program on their iPhone actually who are mainly sign language users but use it just to ask for stuff in shops etc if they have speech that is difficult to understand. People who wouldn’t normally consider been seen with a ‘communication aid’. Its odd I seem to be judged as more physically able when in sporty style chair or on scooter than in Electric chair, but taxi’s won’t take big mobility scooters now and with all the swing gates and A frame stiles the council are putting up all over place accessing places like my local park and shortcuts is impossible on the scooter, so was left with no choice but to buy one. Another thing Ataxia has had huge impact on is my finances, luckily we had always been encouraged to save from young and I had to rely on those savings alot as getting equipment from NHS is likely getting blood from a stone! Their rules for electric chairs is particuarly annoying. You aren’t entitled to one unless you need it around your house too, so cos of the 90 degree angle between my bedroom and lounge (and scooter in hall) getting a standard RWD chair from one room into the other is practically impossible. A FWD however will do it easily, however the NHS don’t seem to like flexibility they only provide a standard chair. I had read a story of another woman getting a Genie standing chair funded by her PCT, but I have heard nothing back from mine, not even a letter of acknowledgement. So that looks like another £6,000 I have to find myself if I want the chair that would give me the best chance of the most independence and better health (benefits of standing chair) from been able to stand for at least a full half hour each day. As the chair fully supports my body whilst standing I don’t have to worry about balancing and my arms are free to do jobs standing. After been trapped indoors for nearly 2 weeks, unable to get mobility scooter out to get around the village and to shops cos of all snow I am reconsidering the X5 frontier all terrain chair, although that starts at £8,500 and doesn’t have a standing feature. Would I still get up this icy road and my drive with 6″ of snow if I bought one of those instead of the Genie? Hard to know as when I rang up the guy he said they were unable to get to me cos of the snow!.. but could do it when it thawed. so how am I meant to test drive it in snow/ice???? A standing chair would have bigger health benefits and be used daily for physio but also after been trapped indoors for nearly 2 weeks due to snow, especially has I received no offers of help with walking Inca or getting food I have to consider needing a better way to get out, as winters seem to be getting worse and have virtually no support unless I pay an helper and I can’t see anyone only wanting a job for a few weeks when it snows. (can’t afford full time helper all year round AND find money for new chair… especially with all talk of cutting DLA and having to go through the changeover from Incapacity Benefit to ESA). 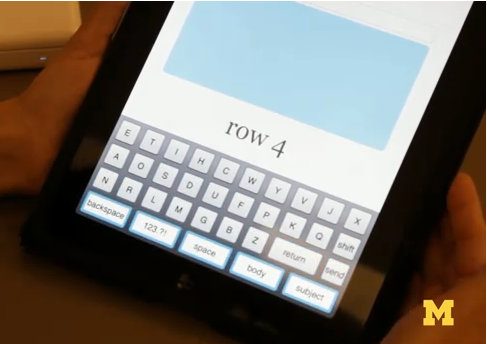 This app looks interesting, its being created by some students in MIchigan and allows you to use the whole screen as a button whilst the app scans a keyboard. The letters are in order of most frequent letters in most words to speed up the process, when it gets to row you want you press anywhere on the screen then it will highlight each key in turn going across, press anywhere again when it gets onto letter you want. This would be really handy especially on iPhone and iPod Touch where the whole screen area then becomes the ‘button’ instead of having to try and hit the tiny qwerty keys. 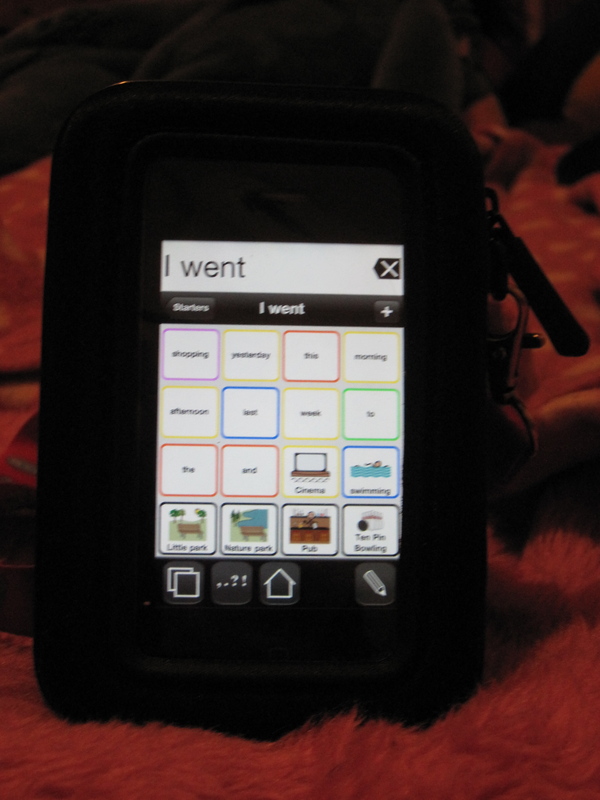 Although it seems to have originally designed for patients with Cerebral Palsy it would benefit anyone with motor co-ordination difficulties who would like to be able to use an iPhone or iTouch. It would be good if this could be transferred to be used in other apps such as Proloquo2go particularly once they add the word prediction to the keyboard. Although I would manage this fine on the iPad version it would be difficult on the iPhone but been able to use the whole screen as the button to stop it on the letter/prediction I wanted, it would be much better. I’m keeping fingers crossed this makes it to the Apple app store as it would be a great benefit for people with Ataxia as phones get ever smaller. I have wanted an iPhone since they first came out, as I always had in my mind a smaller device that I could just have with me when I needed to ask for anything in shops and people found me difficult to understand. As my handwriting got more difficult to do quickly, writing a quick note on paper was harder. 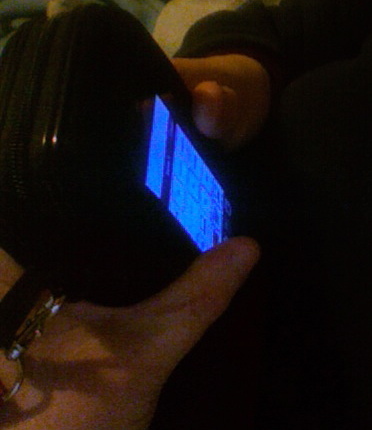 When I asked for assessement for communication aid I originally wanted the Say-it-Sam on a PDA as I thought I could manage this for both texting and using to ask for stuff. The assessor thought I’d be better off with a Lightwriter, although we did try the Typespeak on a 5″ screen PDA and I struggled. The main problem I had was gripping them and trying to use them at same time and keeping hands steady. 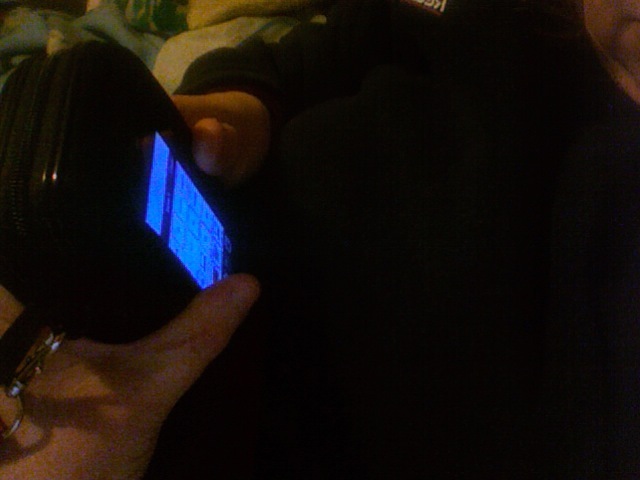 The other issue with the original iPhone was the on-screen qwerty keyboard which was only available in portrait mode. 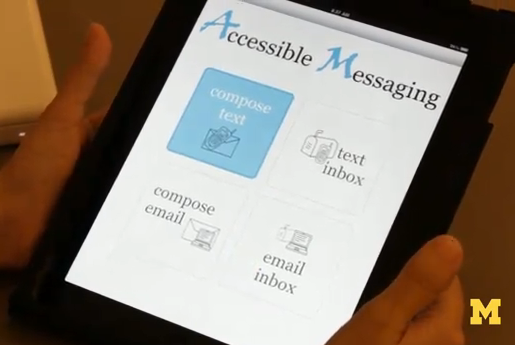 As it has been out longer, there are now a much wider range of apps to help and the ‘assistive apps’ have really taken off. With the latest version of the iPhone OS you can now connect a bluetooth keyboard which I knew would help with texting and setting up pages on Proloquo2go. I managed to find a folding bluetooth keyboard I could manage on eBay, it connected to my iPad so I knew it would connect to an iPhone, I also found out about Tikinotes free app which reduces a qwerty keyboard to 6 big buttons and includes word prediction allowing me to be able to text from the screen as well as via a buetooth keyboard. 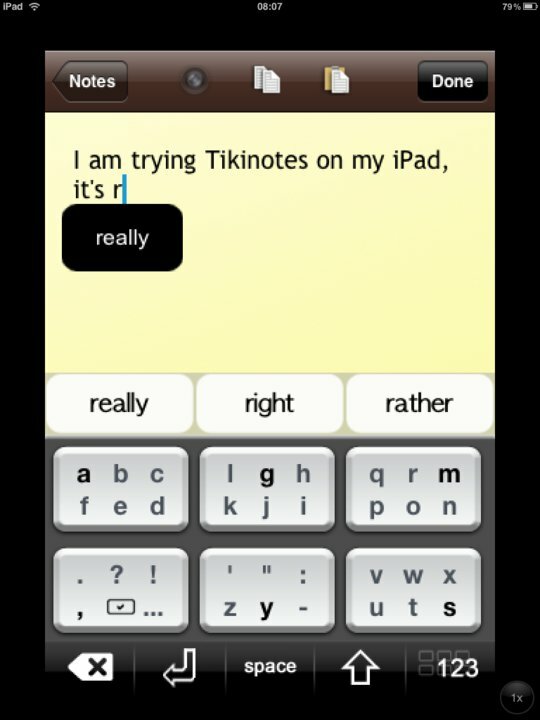 That solved the texting issue and setting up lots of sentences on P2G with the help of the Bluetooth keyboard too. The next difficulty was keeping grip of it. The iPhone4 looks gorgeous but is very slippy. 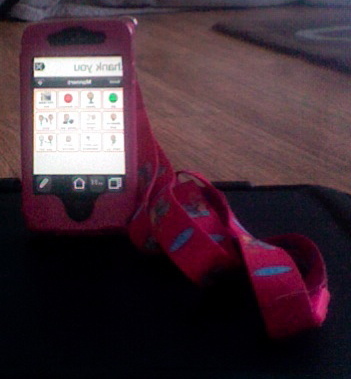 To start with, I got a cheap pink flip case off eBay. I had been using a flip case with my Blackberry, the front of the case gives you something extra to grip with one hand as you fold it back the screen is then clear to try and hit the buttons. Attaching a lanyard also gives me something to grab and help me pick it up. Its great to be able to slip it around my neck too so when I take dog out for walk I have phone with me and I can’t drop it if I need to text for help. The only downside is when I took it xmas shopping to use to ask for stuff in shops, people were unable to hear Proloquo2go cos of all the background noise, I also had to have bigger buttons so had to scroll alot up and down pages. I knew if I could get right case I can use thumbs which are slightly still better co-ordinated and dont get intention tremor in them like I do with fingers. I have seen some cases but getting batteries in and out of them are a struggle when you don’t have much strength in fingers and they shake as you are trying to push batteries into things. I spotted the iMainGo X which has rechargeable batteries and got it form Amazon UK. Unfortunately I assumed it would come with a UK plug end which it doesn’t so after a few confusing emails trying to sort out what plug was safe to use they are sending me a safe voltage converter I can use with it until a UK plug becomes available for it. I’ll let you know how it goes when I have had chance to try it out and do a full review with pictures. My main gripe with the iPhone itself, maybe its just the vodafone deal, is they didnt tell me when I got it I was paying £1 a day for the internet whether I used it or not. As I’m mostly housebound I didnt relaise, I assumed I was getting emails cos it was connected to my wi-fi, it wasn’t until a friend took me shopping and I was still getting them and my credit vanished really fast that I phoned up, as I was quite sure I hadn’t asked or paid for a data plan. They said its easy to just disable it then you won’t have to pay £1 a day so they turned it off, a week later a friend tried to send me a photo (MMS) and I can’t receive them or send any back, so emailed customer services again, it turns out if I want MMS I have to switch the GRPS back on and pay £1 a day in case I want to send a photo or use internet outdoors. This is annoying as if cheaper phones without internet and data plans can still send MMS without been charged £1 a day, you’d think a £500 phone would be able to do it too! I think if I hadn’t wanted a device I could both text from and use with Proloquo2go I probably wouldn’t have bought one. As a communication aid however I love its compactness and Proloquo2go is a great app which allows you to basically design your own device. I’m hoping once I get the adapter sorted for the speaker case I will finally have the device I wanted in the first place and solved my difficulties with gripping and using it at same time. Its been a bit of a gamble and expensive for both the iPhone and case (not including P2G which I already had on the iPad), but it is still significantly cheaper than most dedicated AAC devices and just as good. It can also be done much cheaper if you got an iPod Touch instead of the iPhone, and you could pick one of those up used for cheaper, if you could manage putting batteries in cheaper cases you can have similar package for easily under £400. I also do believe you can use P2G over the iphone to speak for you but of course you need to be able to hear the other persons reply! You would also need to take it out of the case for this I think. As I’m deaf and only use it for SMS texting I would be able to do this from inside the case too. I’d really only need to remove it if I wanted to use it for camera or video and to recharge the phone. (the rechargeable part of iMainGo X only applies to the actual speakercase, it doesn’t recharge your phone too). 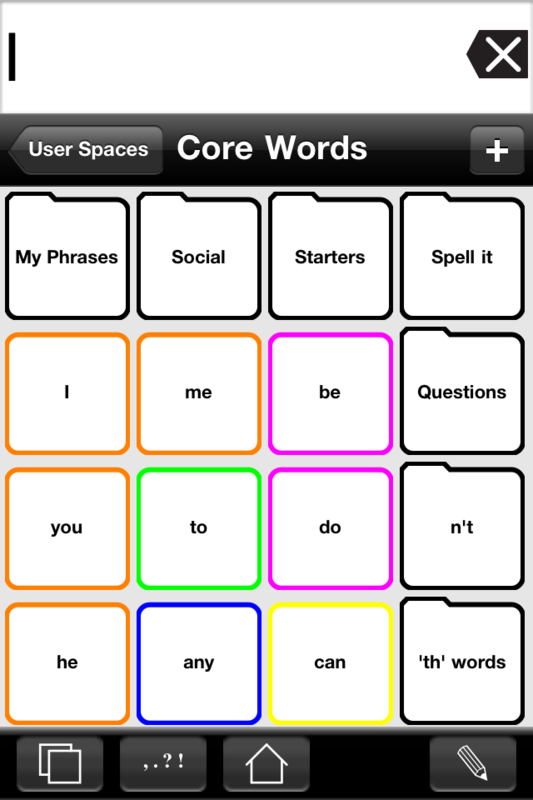 In last four screenshots you can see me building a sentence via the ‘core words’ pages. The auto-conjugation of verbs is a great feature in P2G (pic 9) whereby pressing and holding down ‘be’ also gives you am, is, are, was, were, will be, being, been. Some are disappointing for example ‘can’ only types ‘can’ where it would have been useful if it also brought up can’t, could, couldn’t, so you can see on pic 8 I have added a category ” n’t ” which includes words such as can’t, won’t, didn’t, shouldn’t, couldn’t and also some negative sentences to save time ‘I don’t want that’, I don’t like it’, I’m not ready etc. Words such as the, that, there, they’ll, are commonly used so have their own category folder which I also included ‘time’ words.. tomorrow, yesterday, today, next, last, week, month, year etc, so sentences such as “I’ll see you next week’ can be done quickly in a few keystrokes. I have to create another category for contractions such as I’ve, I’ll, you’ve, we’ll as they aren’t included and it would be useful if pressing and holding the ‘I’ would bring up the others I’ve, I’ll, I’d etc as that is the way most adults talk, they wouldnt say ‘I will see you Tuesday’ they’d say “I’ll see you Tuesday’. 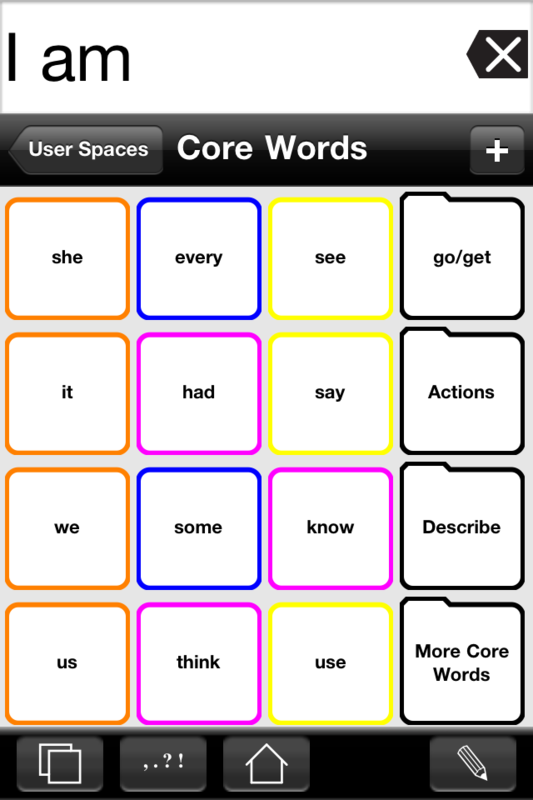 This is an american based vocabulary though and also was originally aimed at children with language difficulties (mainly Autism) so you may find you need to create your own pages for stuff you usually need to say where people have difficulty understanding you, if you are an adult with acquired speech loss. Despite the time needed for all the setting up pages, it is an excellent app and I personally, enjoy making my own pages and finding ways to create full sentences I’d want to say in just a few presses. As a full qwerty keyboard would be far too small for me to use on an iPhone, P2G gives me a way to use a smaller device as a communication aid when I don’t necessarily want or need to carry a larger device with me. I would like to see word prediction on an iPad version of P2G though where the keyboard is much bigger and easier to manage in landscape mode and possibly quicker for longer or spontaneous conversations where I hadn’t predicted that topic or question. Overall I am glad I invested in it and took the chance that I could make it work for me.